Moving to a new home is exhausting and overwhelming for anyone, but for parents of young kids, it can be particularly taxing. 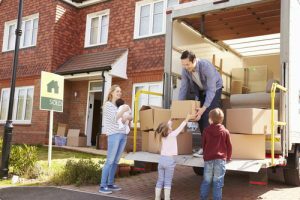 The five tips will help your move to run a bit more smoothly by taking your own hard work and time into account, while also remembering that your kids will be a bit rocked by the move as well! Pack kids’ items while they’re sleeping. Don’t try to pack a few boxes of toys, clothes, or kid gear while your children are awake. They’ll undoubtedly find Lego sets, trucks, and dolls long abandoned and decide that they can’t bear to part with any of them for a few weeks until the boxes are all unpacked. Wait until they’re in bed, and get their things, old and new, packed away, before little fingers seize them. Seek out babysitters during those final weeks of packing. While you might be feeling the weight of all of the possessions you need to pack, the help you need is not with packing. You need someone to watch the kids while you pack so that every box you fill stays filled, and your boxes pile up at a faster rate. Hire a few hours of help on a weekend or ask family and friends if they’ll take the kids for a day out. Unload a few things. Chances are that your family has acquired a lot of items over the years that sit unused. Old toys, strollers that are no longer used, clothes that little arms and legs have long since outgrown clutter your basement, attic, and closets. Take advantage of online parents’ groups, Craigslist, and Facebook Marketplace to sell your gently used items. Plan a new surprise or two. The transition to a new home is difficult for anyone, but kids are often rocked by the move from an unfamiliar space to a new one. Make the move a little sweeter by planning a surprise in your child’s new space, whether it’s a new toy, a cool new feature for their room, or a fun new activity. One family we know got an ice cream maker and had it waiting on the kitchen counter of their new home to the delight of their kids. Say proper goodbyes. Take a little time to allow your kids to say a final goodbye to your home, and to any special places within it that they truly loved. Helping them to remember some of the good times you had in that space might elicit some tears, but is healthy in the long run. And of course, give yourselves, kids included, a bit of a break. Allow yourself to pack a little messily, forget a few things on your checklist, and maybe get a little emotional along the way. Remember that after a little while, everything will settle and your new home won’t feel so new to you or to your young children.